Located in quiet street, ROW fully fenced property. North facing with large/living deck area complete with a gas BBQ and outdoor furniture. Modern light open plan living area, stylishly furnished with all the modcons, including dishwasher, dryer, and TV. Also has 2 toilets. There is a Queen bed in master and Double bed in second bedroom, and in the third bedroom, 2 single beds.The third bedroom is attached to the house, but access is outside not through the house. There's a mountain bike,and ladies bike you are most welcome to use. 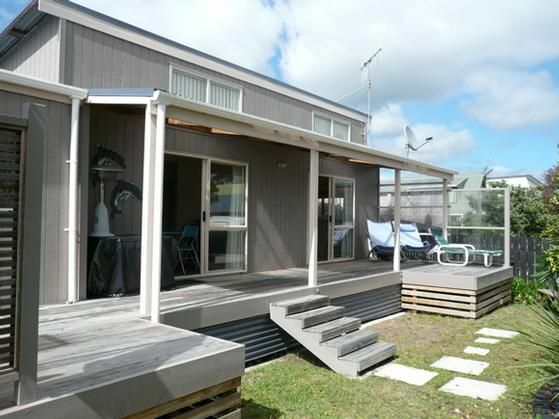 It is an easy 8 minute walk to the main beach( surf patrolled area) and 10 minute walk to the estuary beach. The Bach is safe and secure for children. Please note: NO pets over the Xmas and New Year period. Please check with us for more details. High standard of accomodation in a great location. Would highly recommend! We really enjoyed our stay, and enjoyed cycling around Whangamata using the supplied bikes. A short walk to the beach/playground and a longer walk/bike to the lovely estuary. The house is very tidy and pleasant and has everything you need for coffee, washing, relaxing outside and other necessities. The only thing it lacks is wi-fi but we didn't miss it. Would recommend. Great Bach handy to amenities and short walk to beach, clean and well appointed all you need for an enjoyable break. !